As ever, up the Boro! Just checking there is no one hiding behind the furniture. Thought Id pop in for pint…. Just dropping in for a last look around the old place before they pull it down. A bit like visiting Ayresome Park. Thanks for all the memories, and for one last time………. Virtual South Terrace……… I Salute You! You are about, come on over and join us. GHW, nice to see that you are well, just before the Crystal Palace match I am setting up the “exmil challenge 2017” on the diasboro site, I hope you can join in. If you cannot get on the other site I will copy it here and then check for entries from you or anyone else who still checks Untypical Boro including AV, all the best to everyone. Many of you will be familiar with the Exmil Challenge but for those who are not it has become somewhat of a tradition for fellow posters as the season reaches the sharp end. It’s a welcome chance to channel nervous energy by chewing over the possible outcomes of the upcoming games that involve Boro and our rivals. 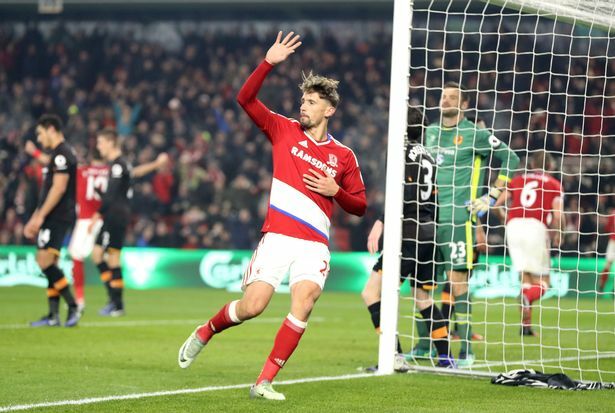 The previous challenges involved Boro’s Championship campaigns and our rivals for promotion – but this year it’s all about staying in the Premier League and avoiding the dreaded relegation. Who will start to fade as the pressure mounts and which teams will become emboldened as they stack up the precious points. The Challenge this year is in three parts, with the first part taking us up to the international break/borefest and a chance to reflect on how the situation is looking. By then it’s quite possible some of the teams currently involved will be waving at the relegation crowd from a safe distance, whist others will start to experience the mental strain and feel their energy being sapped by the all too real grip of relegation. Last week I looked at the managers involved in the relegation struggle (A Brief History of Time in football management) which attempted to give an insight into how their team may fare by looking their previous experiences. Now it’s time to assess the possibilities of each team’s fixtures – for some of the teams playing below their potential a couple wins will lift the pressure and suddenly the game becomes easier. Swansea are an example of what winning games can do to a team and it would apply to most of the others too – particularly Leicester who not only can’t win but haven’t even scored in their last six games. The difference with the predictions this time round (as opposed to promotion seasons) is that the relegation pack rarely win games. If you take a rejuvenated Swansea out of the equation (who have won four of their last six) the other six teams have only chalked up four wins between them from their combined 36 games – three of which were against fellow strugglers – twice Bournemouth and once against Palace. Basically, in the last four games, the non-Welsh relegation teams are only averaging just over half of a point per game. So when making predictions do you play the percentages or do you take a punt on a few teams to try and gain an advantage. I thought that there would be no need for a challenge this year as I knew we would not be challenging for Europe but I was hoping we would not be involved in the relegation dogfight, I should have known that BORO do not do things the easy way. The challenge is the same as the past years, this year being in 3 parts, the first part taking us to the International break. Due to the success of Boro in the FA cup and other teams having fixtures being postponed due to their opposition being as successful as Boro, Part 1 and possibly Part 2 fixtures will be disproportionate until we know when the rearranged matches will be played, so in part 1 some teams will have 4 fixtures while others will have 3. The format is the same as previous years, in that each entry will have to predict what each listed team will have at the end of each Part. If you predict the correct amount of points for a particular team, you will score 10 points but for every point + or -, you will lose a point. As an example if you predict Team A will have 28 points but they actually achieve 26 points you will score 8 points for that team, the same as if Team A actually achieves 30 points. Totaling the points you score for all teams will determine your position in the Exmil Challenge 2017 league and the points you score in Part 1 will carry forward into Part 2 then your total will carry forward into Part 3, at the end of which we will have our final placings and overall winner. Werdermouth has devised an entry form to make predictions easier to submit (Is there no end to this mans talents) the form will show each teams fixtures and all you have to do is follow his simple instructions and press a button for win, draw or lose for each teams fixture and it will automatically increase that teams points total, depending whether you pressed win or draw. When you have completed the form and pressed submit, it will send an email of your entry to me. Because the new interactive form allows us to easily record individual match predictions, these will act as a kind of ‘goal difference’ – so the tally of correct match predictions will be used to separate people on equal points. In the event of joint winners at the end of Part 3, the winner will be determined by the amount of correct match predictions throughout the challenge. It is quite possible that other team (s) will enter the dogfight during Part 2 or 3, an example is Burnley who’s next four fixtures are away from home and since they have gained very few points (1, I think) away it is possible that they may plummet. If a team enters the fight they will be included in the next Part of the challenge. I wish everyone the best of luck in this years challenge but most of all, the best of luck to the mighty BORO. If you cannot get on https://diasboro.wordpress.com/ then the first part of the exmil challenge 2017 is predict how many points each team will have after the following fixtures, in brackets after the Team name is their current points total. If you would like to post your entries on here I will check up to the closing date for Part 1 which is 1400 hrs Saturday 25 Feb 2017. Good luck to everyone especially the BORO. Was on my home from Diasboro when I thought I’d pop in for pint – everywhre I go there’s miserable faces – mine too!! Bloody Liverpool why couldn’t they do the business. Anyway see you all over the road. Sad to see it so empty. Goodbye Premiership in my opinion certain “ones of our own” have brought this football club down, in a quest to further their own ambitions along with the judas, who has now proved that he is no more a football manager than I am, in my own honest opinion. If SG does not clear the poison out of the club then IMHO next season will be more a relegation battle than a promotion push. Goodbye Untypical Boro you gave me many hours of pleasure. Blooming scriptwriters eh! Aitor just got out of the shower and apparently it was all a dream and we’re still in the PL…. Think you’re reading from an old script ! Straight over your head. Whoosh! I’m a bit slow first thing ! Nice to see you are still about GHW, are you going to join the gang on Diasboro, maybe you have become a silent reader or your too busy watching Dallas reruns lol.